Bandai Namco announced that JoJo's Bizarre Adventure: Eyes of Heaven is coming West. The CyberConnect2-developed fighting game will hit exclusively PlayStation 4 during Summer 2016. SANTA CLARA, Calif., (December 21, 2015) – BANDAI NAMCO Entertainment America Inc., the premier publisher of anime video games today announced that JOJO’S BIZARRE ADVENTURE: EYES OF HEAVEN will be making its way to the Americas exclusively for the PlayStation®4 computer entertainment system. Strike a pose and team up in ultra-stylish two versus two 3D action-brawler battles with characters from all arcs of the incredibly influential JoJo’s Bizarre Adventure anime and manga series. JOJO’S BIZARRE ADVENTURE: EYES OF HEAVEN is developed by famed Japanese video game studio, CyberConnect2, creators of JoJo’s Bizarre Adventure: All-Star Battle, the hit NARUTO SHIPPUDEN: Ultimate Ninja STORM series as well as many other fan-favorite franchises. JOJO’S BIZARRE ADVENTURE: EYES OF HEAVEN turns the world of JoJo’s Bizarre Adventure on its head with a brand new original story supervised by Hirohiko Araki, the creator of the original manga series. Utilizing a unique two versus two style of gameplay, players will be able to select from over 50 characters, each with their signature attacks that fans of the series know and love. Characters are divided into specialized fighting styles, giving hints to the type of attacks characters may use along with specific strategies players must employ when in the midst of battle. Styles can include summoning a spirit to fight alongside the player’s character, harnessing energy to perform powerful attacks, fighting on horseback and more. Players with an understanding of how each character operates will be able to tactically fight alongside their partner as they lay waste to their opponents. This is especially critical in the game’s four-player mode that enables two teams to battle each other in online multiplayer matches where communication and teamwork will be a key factor to achieve victory. 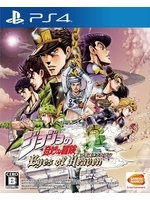 JOJO’S BIZARRE ADVENTURE: EYES OF HEAVEN is currently rated “RP” for Rating Pending by the ESRB. The game will be coming to the Americas exclusively on the PlayStation 4 computer entertainment system. For more information about JOJO’S BIZARRE ADVENTURE: EYES OF HEAVEN or other games from BANDAI NAMCO Entertainment America Inc. please visit; http://www.bandainamcoent.com , or join the conversation on our Facebook page at http://www.facebook.com/bandainamcous or on Twitter at http://www.twitter.com/bandainamcous .